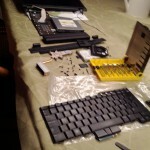 ← Upgrading Sony Vaio VPC F11S1E with SSD …. and HDD! 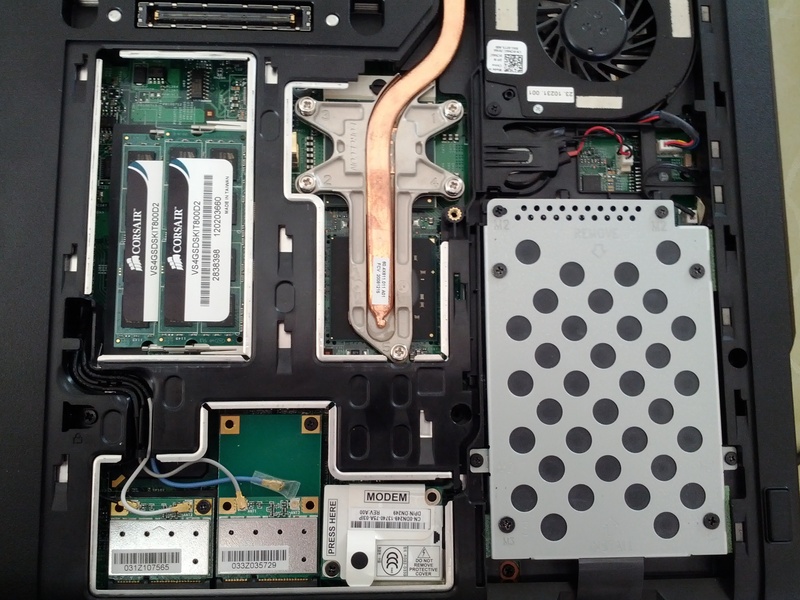 … or how to upgrade it beyond recognition 🙂 I found an abandoned Latitude E5500 notebook on a shelf while visiting a customer. Being in good relations with them, I asked about the notebooks status and why it was lying there in a stack of other notebooks. “They’re just junk” I was told. Hmm, one mans junk is another mans gold. Read on for a great upgrade adventure. 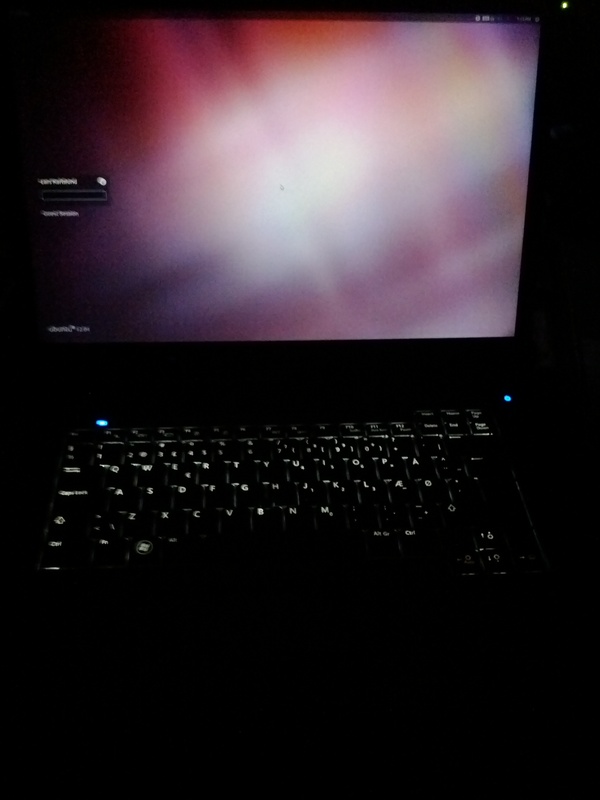 The notebook was: Latitude E5500 Celeron Mobile 575 2.0GHz CPU 15.4″ 1280 x 800 pixel screen German keyboard 2 GB RAM 80GB SATA 5400 RPM drive So all in all, I understand why they junked it. I’m Danish, but even if it had the right keyboard it would just have been too old and slow to bother with. I had a broken Latitude D830 notebook, one where the Nvidia GPU had gone wrong (as they all seem to do from that generation). 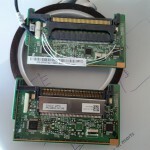 It was completely stripped, no drive, no RAM – but it had a WUXGA+ screen 1920 x 1200 pixels. Yes, they’re hard to come by today, and they don’t make 16:10 screens anymore. The E5500 did not ship with this kind of screen, the highest resolution I could find was 1280 x 800 pixels. 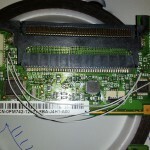 The D830 screen had the inverter bolted on to the lower part of the screen, but the LVDS plug to the display was the same, and in the same position as the original E5500 screen. Could it work? After drilling out some tiny rivets holding the inverter and also removing a bracket on the top of the screen, I plugged it in. Whoa – it just worked! So this got me thinking – I’ve always been under the impression that all you could upgrade in a notebook was RAM and harddrive. But what about the CPU? Could I take the unsupported T7300 Core 2 Duo 2.0GHz and put that in? Indeed – except for the machine complaining about an unsupported CPU when booting (and thus missing microcode update to the CPU), it works. I can live with an annoying beep and having to press F1 when booting. 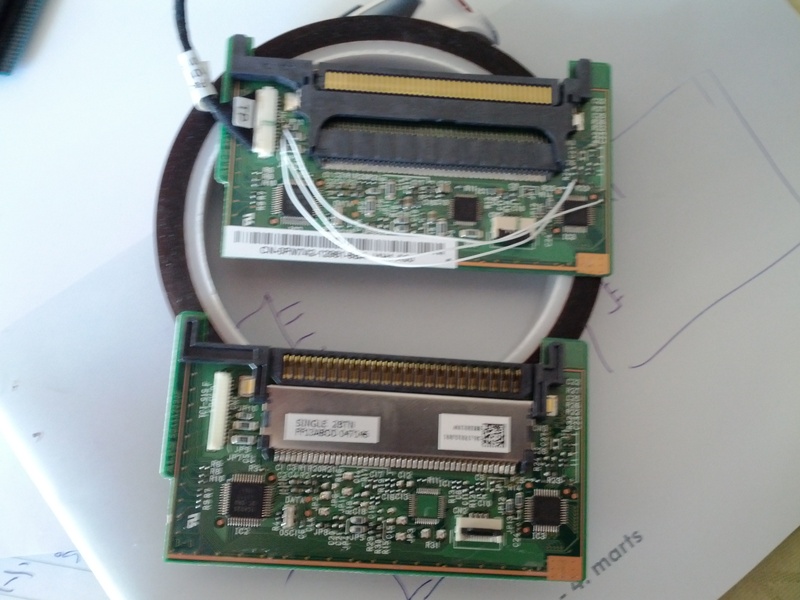 Also I “stole” the modem from the D830, and replaced the 80GB SATA drive with a much speedier 120GB SDD drive I had. Now we’re getting there. The German keyboard started naggning me. Everything worked, but the project just didn’t feel finished. I had to get the right keyboard. 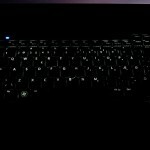 Browsing on Ebay I fould a backlit keyboard for the E6500 series. 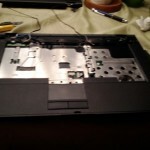 It had a trackpoint and three buttons not found on the E5500. Did I mention it was backlit? And only $25 with shipping. I *had* to try. When it arrived, I disassembled the notebook again, this time taking the palm-rest off, and found my kapton tape and dremel. 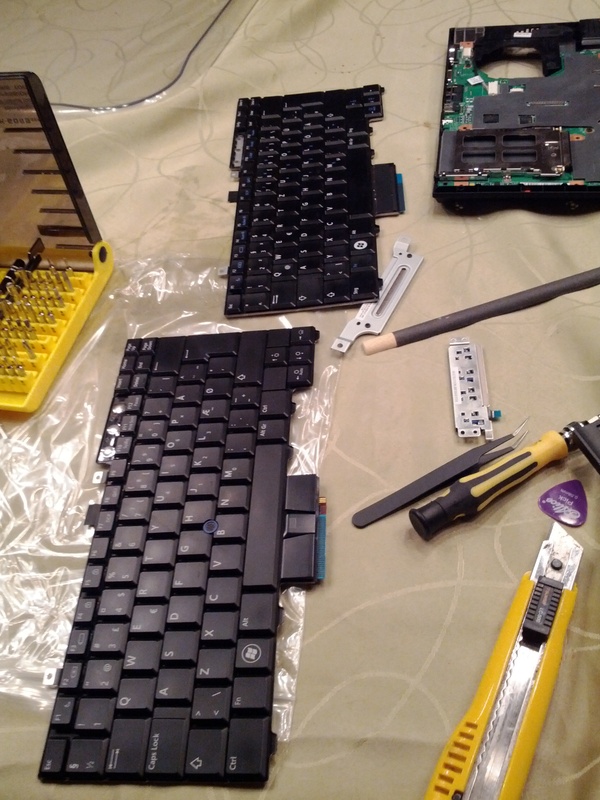 Do or die time, I removed the excess plastic Dell had left where the new trackpoint buttons would be. 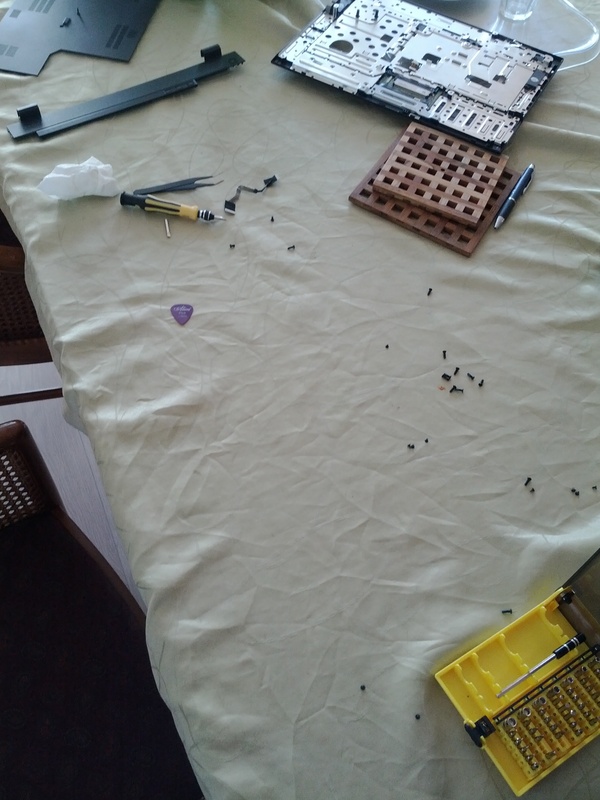 After sanding and making sure everything looked nice, I connected everything, and much to my surprise – it did *not* work. Argh! 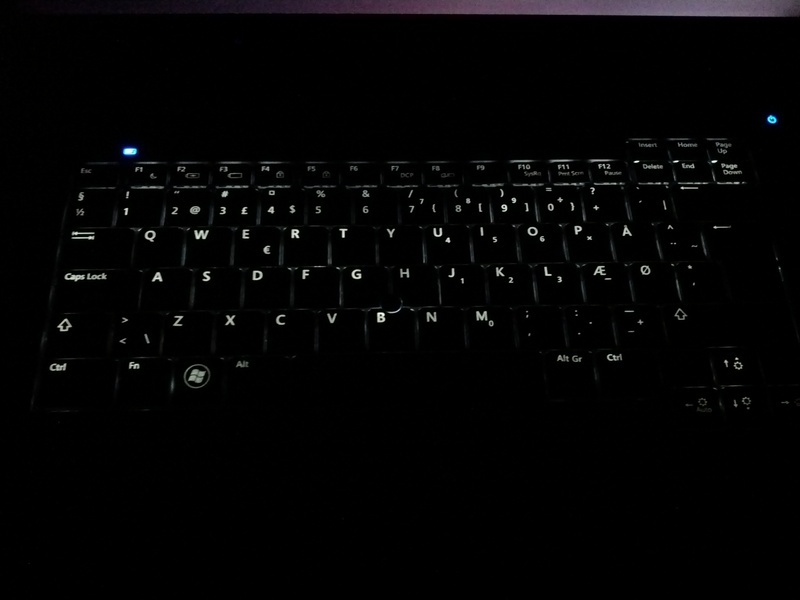 The keyboard worked, but backlight and trackpoint did not work. 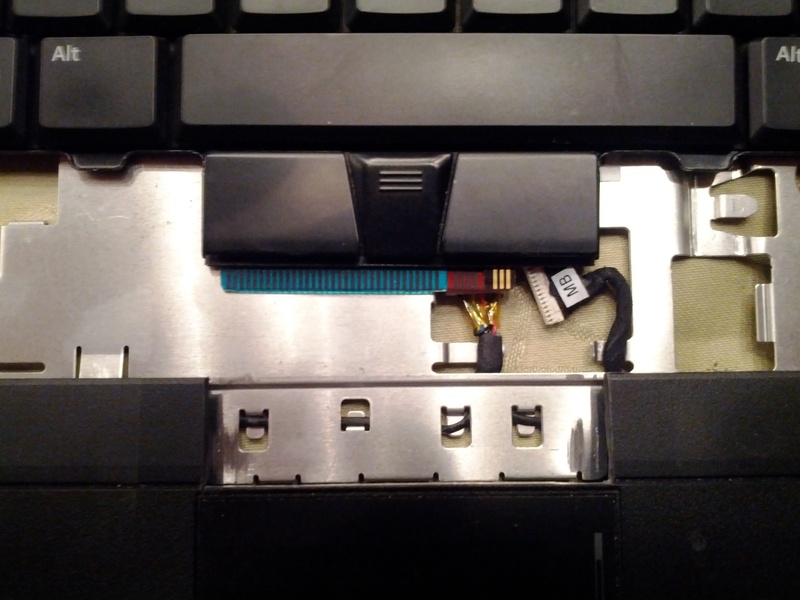 Again Googling around and also looking on ebay, I concluded that the trackpad, which acts as a hub for the keyboard, was the same on the E5500 and the E6500, but perhaps flashed with a different firmware. I found a company in New York that had palmrests for E6500 units for $7,- plus $17,- shipping. Hmm, that was a chance worth taking, so I ordered it and it arrived here in Denmark less than a week later. 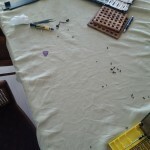 When the new palmrest with touchpad arrived, I discovered that the difference was not (only) firmware, but more chips populated on the same kind of board. 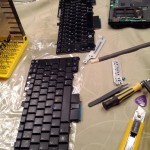 The new board did support the trackpoint, but the backlight did not power on. I don’t know if that is because the cable from the motherboard to the touchpanel are missing some wires, or if the notebook motherboard lacks support. Anyway, I just soldered it up, so its on all the time when the notebook is turned on (and when it’s charging, it seems … whooops!) All in all – a satisfying mod. 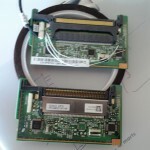 I’m looking for some advices or expiriences wit upgrading latitude E5500 notebooks. 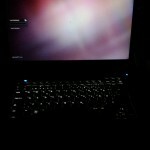 I have E5500 with irish keyboard without trackpoint (on your images I can see keyboards with it). 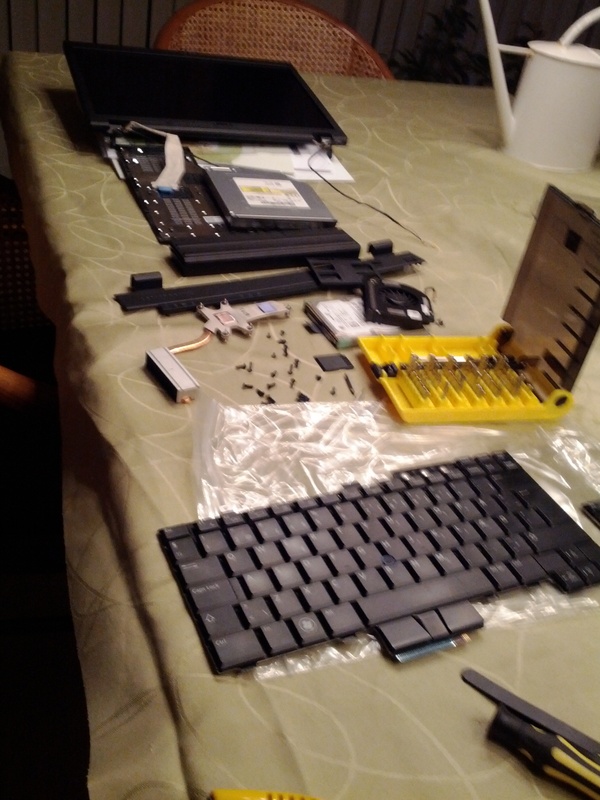 The down key is malfunctioning, so I have to change it, but new keyboard I have does have the trackpoint. I thought that keyboard is connected directly to mainboard but as I read your story again, there’s problem with palmrest. How did you remove it? For a hot fix I’m thinking of cutting room for the buttons, as you did, and for a final I’m about to replace the palmrest. Thanks for letting me about the CPU upgrade. 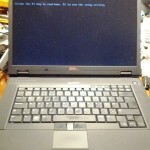 Just saw this same exact Celeron Latitude E5500 on eBay and was thinking of getting it. I do have an extra CPU C2D lying around. Hi. 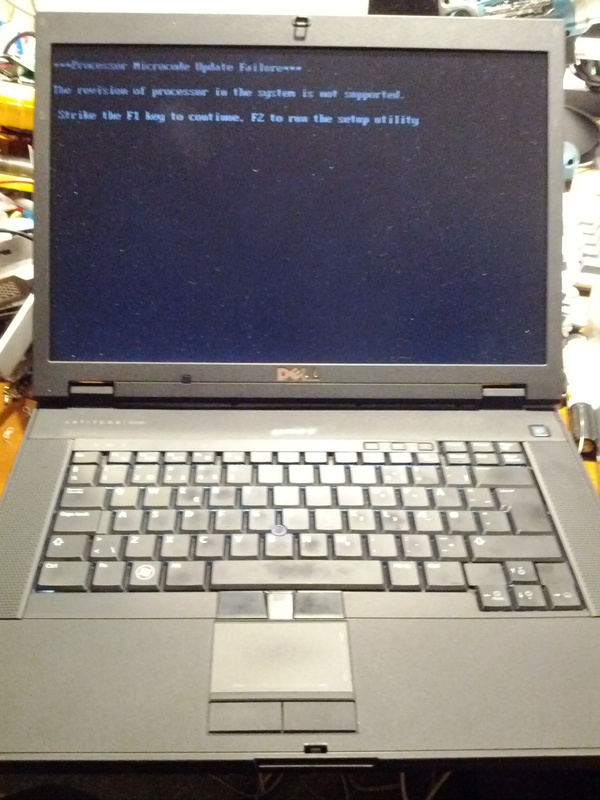 I have a Latitude E5500 too. I really like your screen mod and am going to try it in the near future. My E5500 came with a C2D T9600 (2.8 GHz) which is one of the highest clock rates I’ve seen in a laptop. I’m also considering a CPU upgrade to a C2Q but I don’t know if the motherboard will support a quad-core processor. I don’t want to go down too much in clock frequency, so I am interested in the QX9300 Extreme. 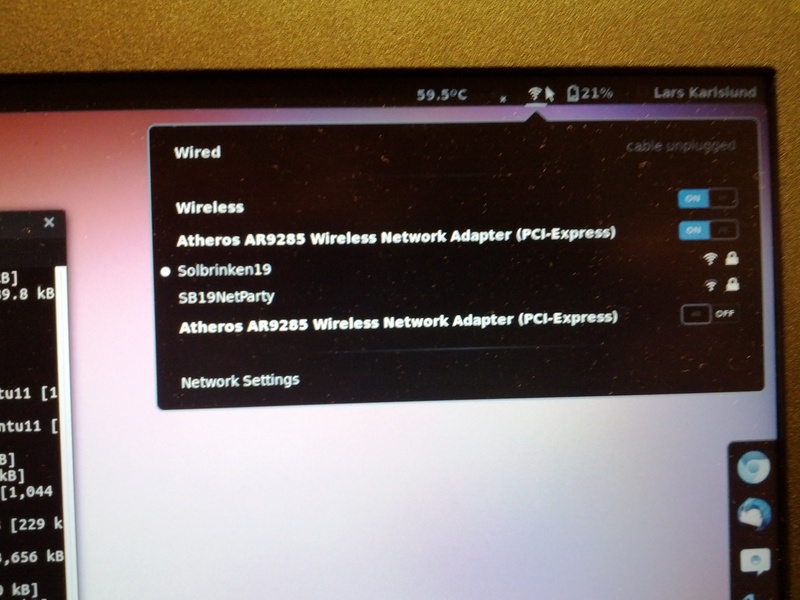 Do you know if it will support a quad-core CPU? Hmm, I don’t know, but as long as it’s the same generation of chips (voltage/FSB freq etc), I think it will work. But you will get a microcode warning every time you power it up. 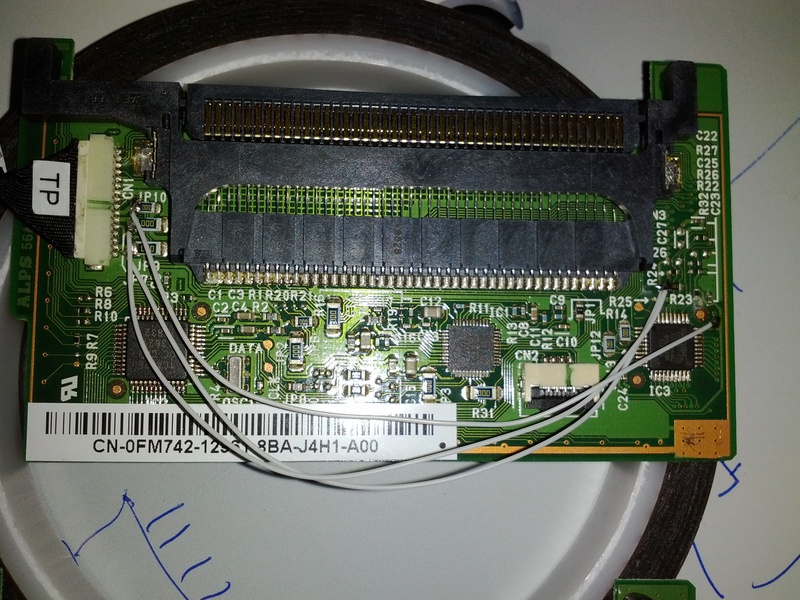 can you provide any more info on the 1920×1200 screen and cable you used(dell part number)? 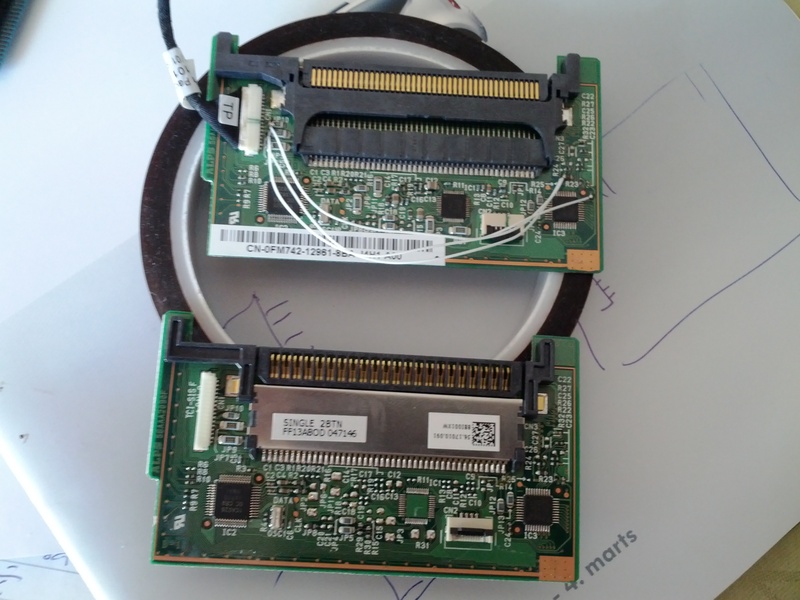 my conclusion was that the lvds cable has to have a different(more wires) pinout. did you use the cable form the d830 or from the e5500? Sorry, it was too long ago for me to remember the excact procedure. 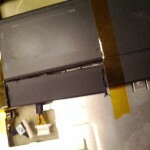 Dear Mr Lars, First of all a big THANK YOU for inspiring my latitude E5500 Screen upgrade, I was frankly tired of the 1280×800 standard screen and moved on to 1680×1050 using a LVDS screen meant for the older D830 , the mod was success. I reused the original E5500 inverter, since it had the mating connector at the right orientation for the inverter plug. 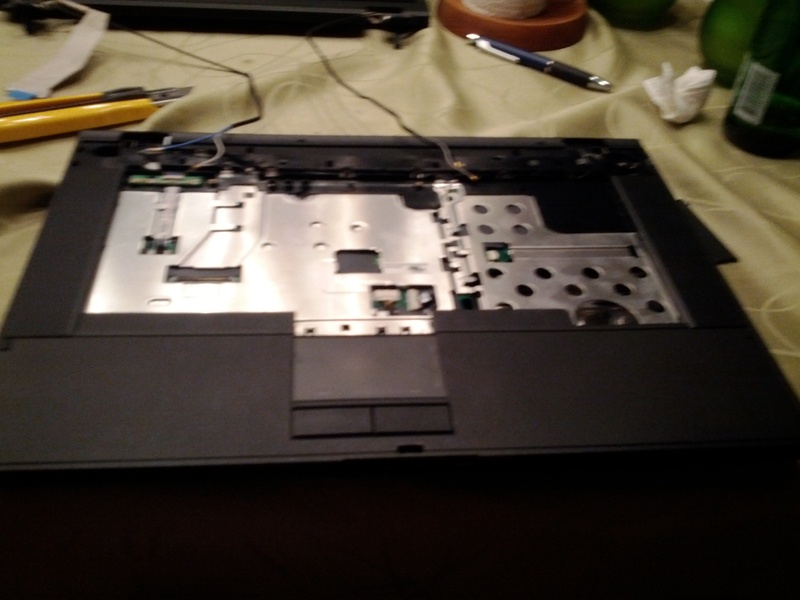 The bigges pain was and remains the bracket on top of the D830 screen, I put back the screen bezel on the E5500 , but couldnt use screws to secure it because the bracket prevents me from installing the screws back. 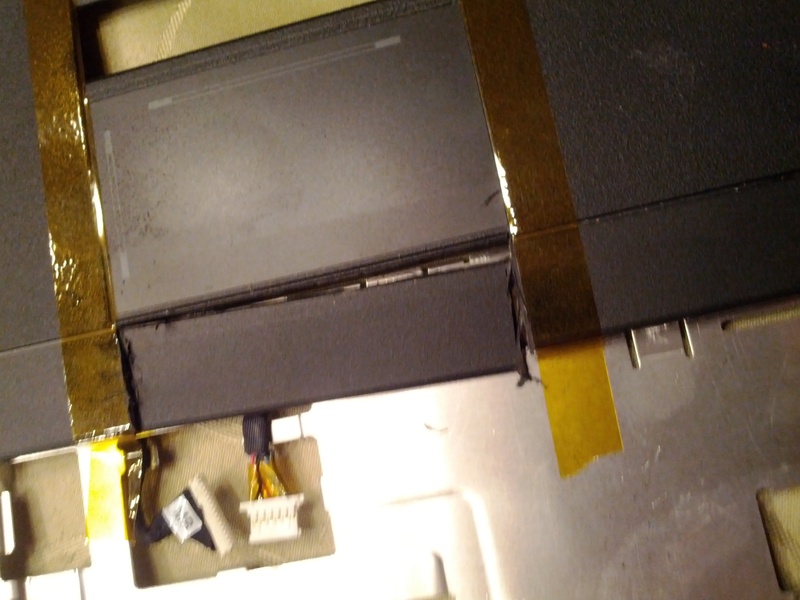 How did you manage to remove the bracket without affecting the rest of the D830 display ? Did you saw it off or were able to remove it ? There were no screws on top securing the bracket , and i guess it was removable , but there was no obvious physical fixture that could be easily removed. 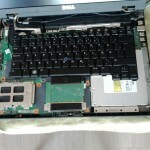 I have a Dell latitude e5500 laptop and I would like to upgrade its cpu. It’s current cpu is c2d e8600, can I replace this cpu with c2d t9600 CPU? Did I help you? Please leave a comment below the post that helped you, and consider donating whatever you find reasonable. The feedback I get from visitors are what keeps me going. Thanks!